We are a research active organisation. All of our services and products are informed by our own research, analysis and testing. We have research interests across different areas of curating such as material culture history and theory, museum studies, archaeology, cultural and natural collections, scientific, industrial and natural heritage, 3D digital objects, Cornish culture and identity, and intangible heritage particularly audio, music and sound. We also welcome undertaking research on commission and providing your project or programme with research capability in our areas of expertise. Our core team has access to a large network of academics, researchers and specialist practitioners that can be assembled for large and small collaborations. An entirely novel way of interpreting shipwreck remains on the seabed inspired by Minecraft. Created by Tom Goskar, Archaeologist and Imagine Specialist for CISMAS on behalf of Historic England. In 2017 Tom was asked to examine an early medieval stone found during excavations at Tintagel castle. One of Tom’s specialisms and active research areas is enhancing faint and eroded details on surfaces such as inscriptions or decorations. The stone had faint writing on it, and given the site’s importance (and mythical Arthurian connections) the team from Cornwall Archaeological Unit and English Heritage were keen to read the text. 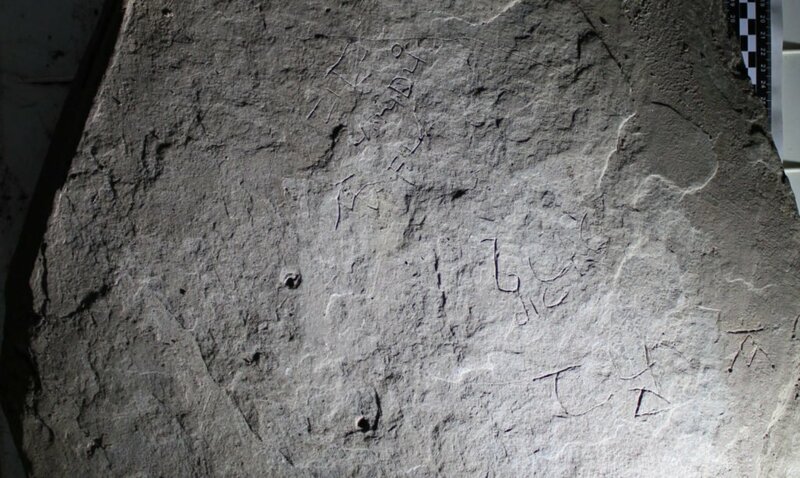 Tom used a technique called Reflectance Transformation Imaging (RTI) to create a highly detailed image of the writing which could be illuminated from any angle on screen. This breaks down the normal concept of a photograph, where the light is captured at the time it is taken and cannot be changed. 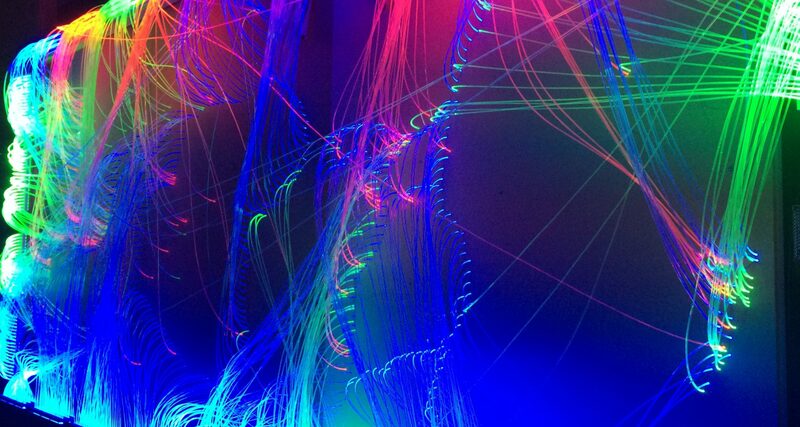 By contrast, RTI captures the direction of the surface as well as colour information. It allows filters to detect when there is a change in surface direction, for example when a sharp tool scratches a letter into an otherwise flat area. The stone was gently and lightly cleaned at the offices of Cornwall Archaeological Unit and an RTI was created using strong directional lighting from many different angles, combined using specialist software. Screenshot of the RTI file. The shadows have brought the lettering into sharp relief allowing them to be easily read. 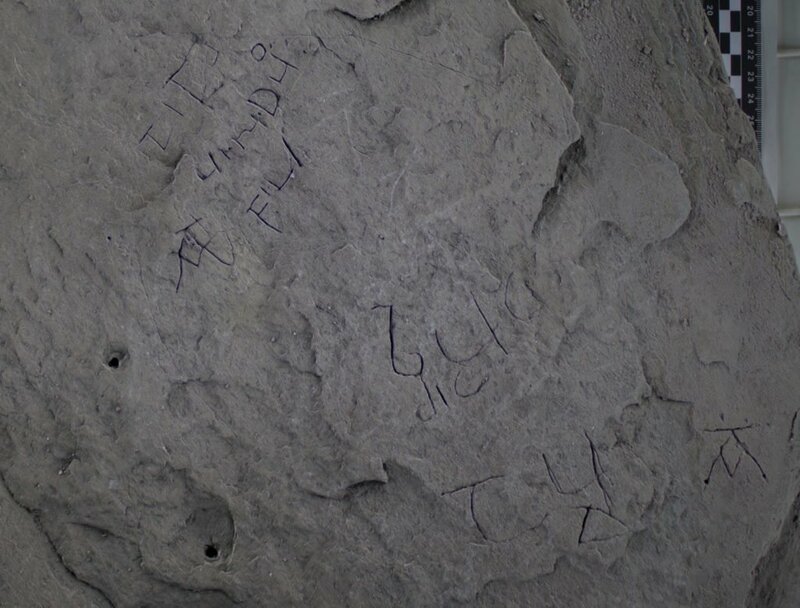 The RTI allowed for the lettering to be revealed clearly against the surface of the stone and for them to be read carefully for the first time. It was an exciting moment to read, for the first time in a millennium, the personal names of people who lived so long ago. The stone includes Roman and Brythonic names of ‘Tito’ (Titus) and ‘Budic’. The Latin words ‘fili’ (son) and ‘viri duo’ (two men) also appear. The excitement of reading personal names for the first time in over a millennium is incredible. Tom passed on the enhanced images and the RTI file to medieval writing specialists Professor Michelle Brown and Oliver Padel for the next stage of interpretation. English Heritage released the story to the press in June 2018, and the stone was featured in the BBC documentary “King Arthur’s Britain: The Truth Unearthed”, aired in October 2018. In 2017 Tom was asked by CISMAS on behalf of Historic England to research and undertake novel ways to explain shipwreck sites using 3D technologies. Tom found that many shipwreck sites were trying to use ‘photo-real’ approaches to showing the scatter of underwater finds on the seabed, with water, seaweed, and realistic-looking objects as you might see them. Being a non-diver he found them to be difficult to understand, and not very effective in helping non-specialists to understand what was going on around the shipwreck. Tom was keen to arrive at a completely new concept, and drew upon his knowledge of theatre studies and minimalistic design to try out new ways of exploring shipwrecks as a non-diver and non-specialist – that is most of the interested public. 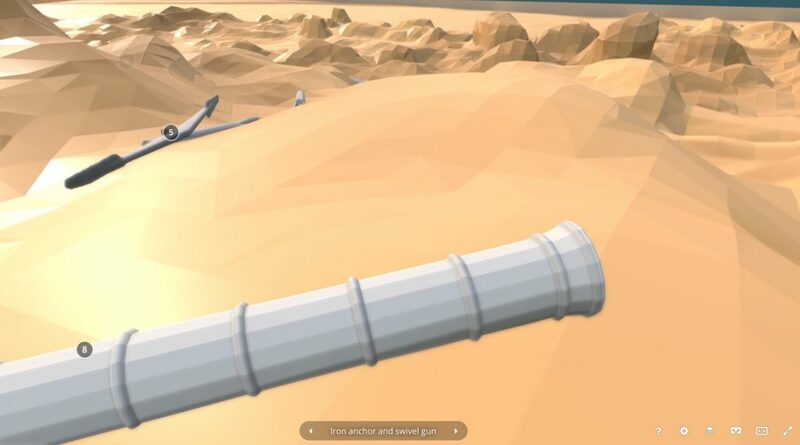 Taking in the stark theatrical minimalism of Bertolt Brecht, the simple ‘voxel’ minimalism of popular game Minecraft, and the trend of ‘low poly’ 3D art, he developed a new way of showing the seabed and artefacts laying upon it. 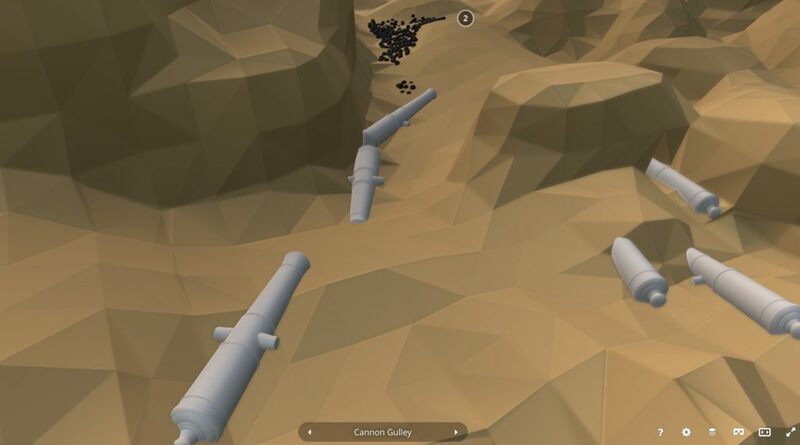 Tom used Sketchfab to deliver the results, allowing people to explore the wreck sites on any modern computing device. The models could even be used from a boat floating above the sites themselves, empowering divers to plan their route around what is often challenging topography – big craggy rocks, seaweed-filled ravines, and boulder fields. 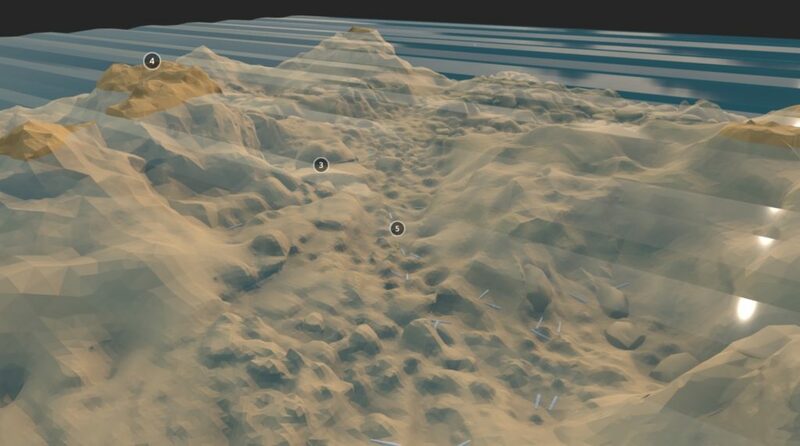 A view through the virtual sea down to the surface below and the wreck of the Association which sank in 1707. The numbers indicate interactive annotations. A simplified model of a swivel gun on the seabed at the Bartholomew Ledges wreck site. 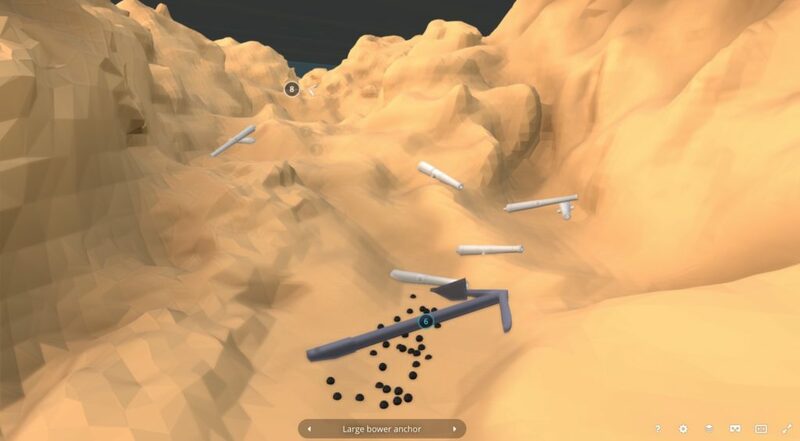 Anchor, cannons and iron shot on the low poly seabed at the site of Tearing Ledge. The low poly seabed model and artefact scatter of the site of the Association, which sank in 1707. “Cannon Gulley” at the site of the wreck of the Association. Note the simplified cannon models. 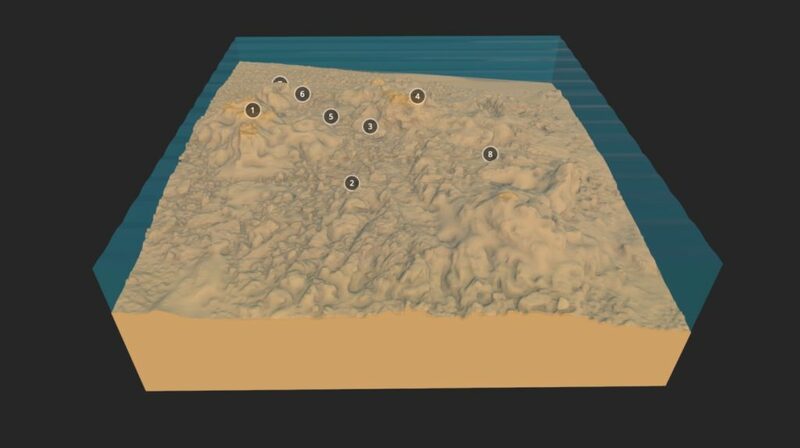 The seabed models themselves are based upon real survey data collected for the project, processed into a ‘low poly’ angular model that still remains a true representation of the topography. Representational objects (cannons, anchors, iron shot, timbers etc) are designed and placed accurately with bright colours to allow them to be identified. The seabed and objects are then placed in a semi-transparent ‘tank’ representing the sea, with the top corresponding to real sea height at low tide. 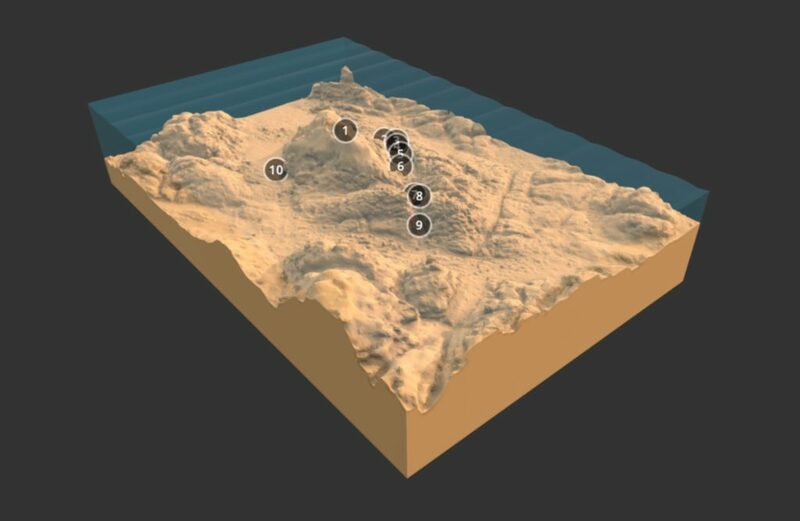 Using Sketchfab’s notation facility, the groups of artefacts were numbered sequentially, allowing them to be clicked or followed automatically for an annotated virtual tour. The project was successfully delivered and completed in 2018.